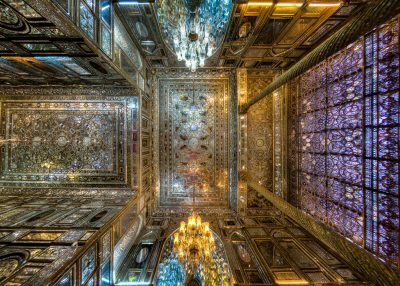 Emarat-e-Badgir (Windward Edifice) is one of the buildings in the Golestan Palace complex in Tehran, which dates back to Qajar era. This edifice has been the location for coronation of Mozaffar-e-Din Shah of Qajar. The building retains a windward on the top which clarifies the title. The exclusive ornaments of this building such as the glasses, the mirrors, and tall columns are of exceptional beauty. As soon as I entered the building of wind catchers,the first and the most important thing that got my attention,was glourious mirror works on the ceiling. Generally,when you think of a mirror,you see it as a tool which you can see yourself in it,that’s why you find a mirror interesting and amusing. But when it combines with art,when it is divided into little pieces and placed next to each other artistically,it makes you to pay attention to the space and not yourself anymore. It’s like the ceiling is a carpet made of mirrors which is seen all over the place.That is why it is so fantastic.